I first met Marek Walczak in Sweden, late 2002. He was showing one of his interactive art works “Apartment” and at the opening he mistook me for my twin sister (who was the curator of the show). Ever since then we have lived and worked together. Besides other things we have designed and renovated 2 houses from scratch and we have also built a tiny little studio house together. About five years ago Marek started to work with Wes Heiss who he has known for a long long time. Like me, both of them have a background in architecture. Besides many other things, Wes knows how to build cars and violins. Over the last few years he has also become an expert in operating 3D printers of various kinds. Together, Marek and Wes has become a perfect team that can design and build really cool media-based public art installations. One of their latest works (which I made some illustrations for) is an art installations in Denver, called 14th Street Overlay. This installation consist of 23 individual small cast bronze sculptures of optical instruments like binoculars, iPhones and movie cameras that are embedded along 14th street. Each object gives you a view of the existing street merged with narratives and projections of the past. I really enjoy working with Marek & Wess. I also enjoy their skills in making cocktails and drinks. With them, there is always a new drink that needs to be mixed and tested. It could be a classic but also something totally new. 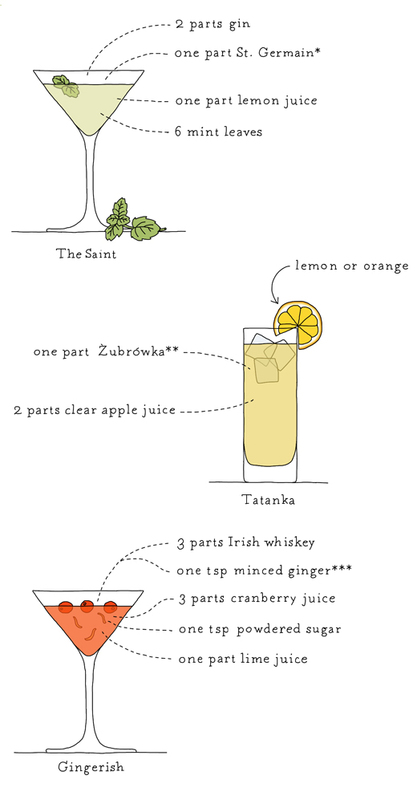 With their help I have picked out three drinks from their cocktail collection, The Saint, Tatanka (a Polish classic) and Gingerish. UPDATE: Just heard that Walczak & Heiss won the commission for Public Art for the gardens of the Berry Center, Wyoming. Congratulations to both of you! * St. Germain is an Elderflower liquor which you probably can substitute with something similar. You can also switch out this part with equal amount of Elder Flower cordial. ** Zubrówka is a Polish vodka flavored with bison grass. *** For best flavor, infuse the ginger with the whiskey for at least 4 hours. Ohhh, The Saint has my name all over it. Love this post! It makes me want to spring-clean my liquor cabinet.